Five representatives from ABS-CBN Lingkod Kapamilya Foundation-Bantay Kalikasan’s eco-tourism sites in Lobo, Batangas visited the four sites of BK in Sorsogon – Buhatan River Eco Adventure, Lola Sayong Eco-surf Camp, Matnog Island Hopping, and Prieto Diaz Seagrass, Mangrove, Coral Eco tourism project to be immersed with the sites’ best practices. Dubbed as “Lakbay Gabay,” the immersion became an avenue for the communities to share inputs on how they have been able to find solutions to different issues that arise in their own sites. Through this, Bantay Kalikasan wants to instil the culture of sharing among the different people’s organizations in a way where the learners eventually become mentors as they learn from each other. This practice also develops a special support system among the different organizations that go beyond the immersion days. Having start-up eco-tourism sites, the representatives of Lobo were inspired with the success of Sorsogon sites especially Buhatan River Eco Adventure where guests can dine and watch fireflies at night, and the Lola Sayong Eco-surf Camp. 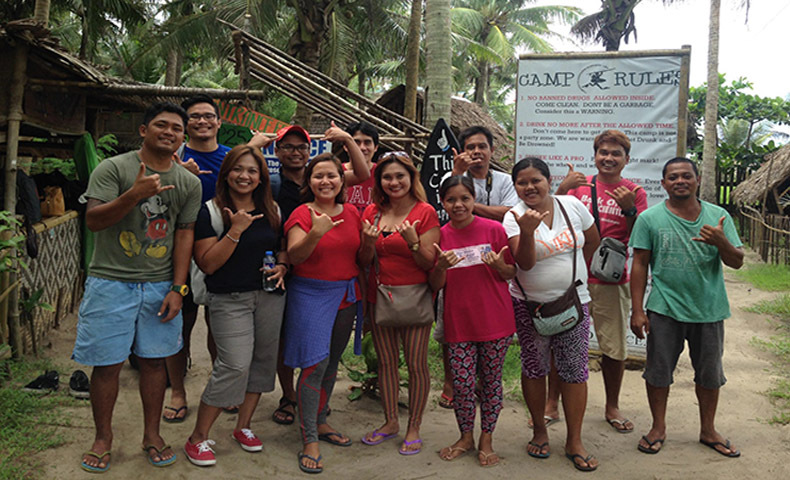 Representatives of Bantay Kalikasan Lobo in Lola Sayong Surf Camp in Sorsogon, with Bantay Kalikasan Main Office Staff and volunteer. “The stories of how they started the Lola Sayong Eco-surf camp, the sacrifices of the community, their unity, were so inspiring. They don’t just run the camp for the money they earn but they also help youth by sending them to school,” Roilan Arguelles from Pagsulong at Pagunlad ng Brgy Sawang Lobo, Batangas shared. After the immersion, the Lobo team was inspired to create ways to make their projects more interesting and to improve their team’s productivity. Representatives of Lobo interact with Sorsogon communities. Left: Matnog Island Hopping site. Right: Buhatan River Eco Adventure site. In 2016, the people’s organization of Sorsogon went to Palawan, one of Bantay Kalikasan’s assisted sites, to learn about the community’s best practices in managing an eco-tourism site. This kind of activity has been a tradition to Bantay Kalikasan to make the people of its 14 sites interact and learn from each other. This year, Sorsogon passed the things they learned in Palawan to Lobo, Batangas organizations. Launched in 2008, Puerto Princesa in Palawan is the first ecotourism site of Bantay Kalikasan. With its Ugong Rock Adventures, it became an inspiration to develop other Bantay Kalikasan communities. Sorsogon’s Buhatan River Eco-adventure is a semi-finalist for this year’s Lopez Achievement Awards and BPI Sinag Awards. On the other hand, Lola Sayong Eco-surf Camp is also a semi-finalist for the BPI Sinag Awards 2017.